Let's Have a FEELINGS Snowball Fight! Feelings Identification Scenarios Game! 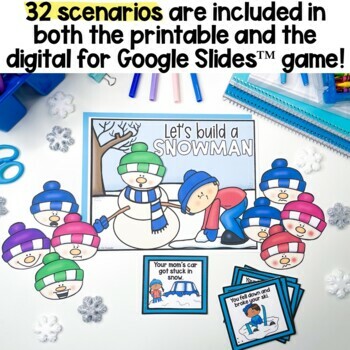 SEASONAL FEELINGS IDENTIFICATION Scenarios Games BUNDLE! Looking for the perfect way to celebrate WINTER but also practice feelings identification and social skills? Or for a fun, winter-themed SEL center? Let's have a FEELINGS SNOWBALL FIGHT! Your students will LOVE this game just as much as mine did! This adorable, festive game can be played one on one, in small groups, centers, or in large groups (on a projector!) 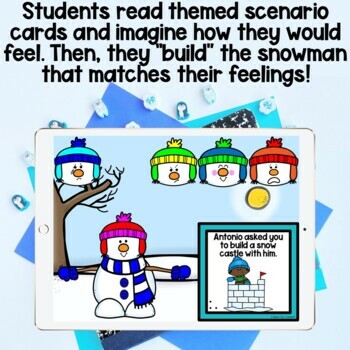 Students start the game by choosing from one of 30 winter-themed scenario cards and reading the card aloud (or beginning readers can ask the educator to read the card aloud). Next, they think about how they would feel in that scenario and place one of 11 snowball emoji(s) that represents their feelings on the snowball fight mat. The educator can encourage a discussion about how we can feel more than one way in one situation AND we may feel differently from our friends in the same situation. All of the scenarios are very developmentally appropriate and relatable for students. And, the snowball emojis are giant: perfect for little hands to maneuver and to represent that kids can have BIG feelings! Do you love this game? You might also like my fall-themed pumpkin version!